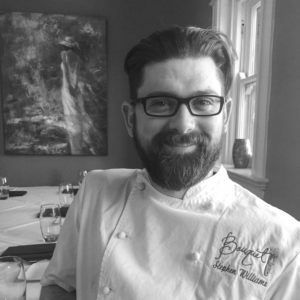 Chef Stephen Williams loves to create beautiful, flavorful dishes for his patrons at Bouquet Restaurant – and he comes by it honestly. As a child, Stephen developed a love for food while watching his two grandmothers prepare traditional southern fare, like country ham, green beans, and angel biscuits. He spent time watching his Nana fry up sides of bacon while serving egg and cheese sandwiches to coal truck drivers who stopped for lunch at her restaurant in the foothills of Eastern Kentucky. In the years since opening Bouquet, Stephen’s commitment to farm-to-table dining has garnered accolades from top publications, fellow chefs, and diners alike. Bouquet has been named the “Best Restaurant in Kentucky” by Business Insider and has earned a spot on Cincinnati Magazine’s influential “Top Ten” list six years in a row. Williams’ ingenuity as a chef earned him a coveted spot in the 2014 “Cincy in NYC” trip, where eight of Cincinnati’s top chefs combined forces for one amazing dinner at New York’s James Beard House. Chef Williams channels his dedication to the community into his work with various local charities and organizations, including collaborations with the Freestore Foodbank, the SIDS Foundation, and the scholarship fund at the Midwest Culinary Institute. He is especially passionate about his leadership role within the Ohio River Valley Local Group of Chefs Collaborative. Stephen continues to live in Covington, residing in Mainstrasse with his wife, Jessica, and their two young children, Findlay and Penelope.